Last month, Roger Misso published an article on this site entitled “What Happens to Naval Innovation Deferred?” and this post addresses a number of the points raised in that submission. First, I would like to thank LT Misso for caring enough about our Navy to convey his thoughts and recommendations through his writing. Further, I would like to commend him for having the courage to stake an opinion and share his viewpoint. -Sailors are the Navy’s asymmetric advantage. -There is a groundswell of positive disruptive thought that exists around the Navy among Navy Sailors and civilians who all want the Navy to sustain its primacy. -It is important for leadership to exemplify the phrase “we’ve got your back”…innovators need top-cover from the highest levels. -We are disestablishing CNO’s Rapid Innovation Cell (CRIC). -The CNO’s Strategic Studies Group (SSG) is coming to a close. There are reasons for each of these actions but please rest assured that it is not a rejection of the innovative efforts going on across the Navy. Innovation has gotten a lot of press globally in the private sector as well as in military circles, and for very good reason. Technology is changing faster than ever before. Product development cycles are shortening in virtually every business. Competitiveness is often seen as being a function of capturing this innovation. One caution is that we must be wary of “innovation” becoming a trendy buzzword or perceived panacea for the future as we ride the wave of its popularity. That could make it go the way of other transformative movements such as the Revolution in Military Affairs, Total Quality Leadership, etc. We must remember that at the heart of the change we seek is disruptive thinking that continuously improves the naval capabilities we deliver for the joint force and nation. This can only be achieved with a fresh approach to learning and a fundamental culture change to the cycle by which we learn. This is why at the forefront of the lines of effort discussed in “A Design for Maintaining Maritime Superiority” is the imperative for High Velocity Learning – as this is the real engine for sustainable innovation. The intent for High Velocity Learning is to have many idea factories for a growing cadre of innovators and disruptive thinkers. If captured by all levels of our Navy, particularly the grassroots level, the engine for innovation will be enduring. To that end, we are breathing life into the idea of High Velocity Learning. USS Benfold (DDG 65) started an innovation grassroots movement called Project ATHENA. The Commanding Officer challenged his crew to solve Navy issues on the deckplate level through the concept that often the people closest to the problem are often the people closest to the solution. That grew into a San Diego-wide effort that is catching on in other homeports too. In March 2016, OPNAV hosted an Innovation Jam – part Shark Tank, part TED Talk – partnering with SPAWAR, ONR and PACFLT’s Bridge and connecting with Project ATHENA and the Hatch to collect grassroots ideas from the Fleet. This has provided funding and engineering support for three Sailor invented ideas to be prototyped for ultimate evaluation for fleetwide applicability. Other Innovation Jams in other Fleet concentration areas are planned. Admiral Swift’s adoption of a process within PACFLT to harness High Velocity Learning called “The Bridge” will ensure that your good ideas will go from being a “thought on the Mess Decks/Chiefs Mess/Wardroom” to reality…with the time measured in weeks and months, not years. The Bridge is a PACFLT initiative launched to discover, explore, and cultivate solutions to Fleet-centric challenges, needs, and priorities and connect the sources and sponsors best suited to prototype, develop, and create policy for fleetwide adoption. SECNAV recently released an ALNAV standing up the Naval Innovation Advisory Council (NIAC) to consider, develop, and accelerate innovative concepts for presentation to the SECNAV and other DON senior leaders, with recommendations to synchronize senior leadership, influence the flow of resources, streamline policy, and/or remove roadblocks that hinder innovation. As a correction, we are not standing back up Deep Blue, but rather reconstituting a capability on the OPNAV staff, in N50, to elevate the stature of Navy strategy and better synchronize our efforts. This will concentrate Navy strategic thought inside the life lines of the OPNAV Staff. Other evolving initiatives which will be used to quickly foster and transition innovative efforts include the Rapid Prototyping, Experimentation and Demonstration (RPED) initiative and the Maritime Accelerated Capabilities Office (MACO). These address the speed with which new warfighting capabilities are delivered to the Fleet to better match the urgency of need. Those will be spelled out in greater detail as this process continues to mature. To be clear, we need every Sailor, active and reserve, to willingly jump in to High Velocity Learning – to be bold, to proffer fearless ideas, and to be willing to dare and drive the Navy forward. As CNO says, “if you are waiting for your High Velocity Learning kit to come in the mail, you are going to be sorely disappointed…because that’s not how this is going to work.” This effort requires us all to play an active role. Navy leadership will have your back and provide appropriate forums to bring your ideas – whether they be products, policies or a different way of thinking – forward for us to experiment with or prototype and then assess its ability to become a best practice for the whole Navy. Our goal is to capture the innovative spirit endemic to the way the Navy works. The Navy has been on the leading edge of innovation for centuries and it is my job to keep us on that cutting edge because, as Roger stated, our people are our talent and our “asymmetric advantage today” well into the future. We have come a long way from the days of sail and steam to all electric warships with integrated power systems that will support energy weapons like LaWS and the electromagnetic railgun. More examples of innovation can be found in our history in carrier aviation to the cutting edge work we are doing now in additive manufacturing, which has been developed through a grassroots effort. Thank you again to Roger and the many others who continue to push ideas (and when appropriate, concerns) forward. This is an effort we all must play an active role in advancing. 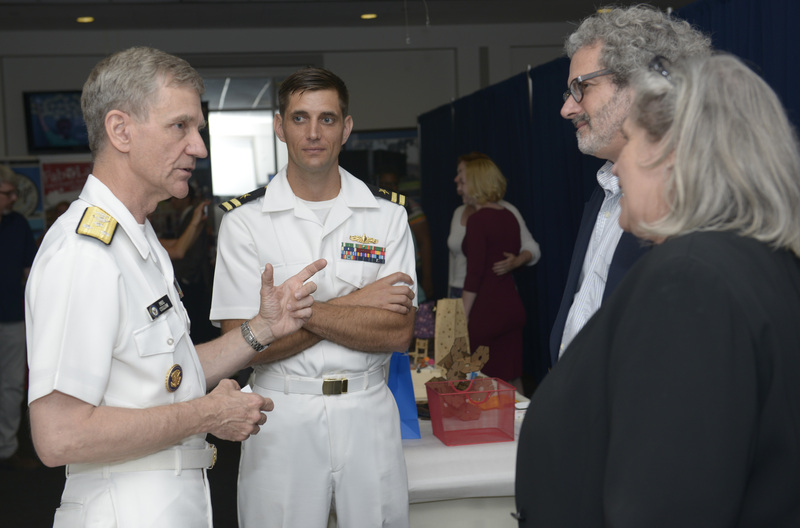 This article has been updated with the status of Deep Blue, and provides additional details on ongoing efforts regarding innovative thinking inside the Navy staff. Vice Admiral Philip Cullom is a career Surface Warfare Officer with more than thirty years of naval service. He currently serves as the Deputy Chief of Naval Operations for Fleet Readiness and Logistics where he serves as the uniformed point person for naval innovation and creativity for the OPNAV and Secretariat staffs. Featured Image: SAN DIEGO (March 16, 2016) Lt. Cmdr. 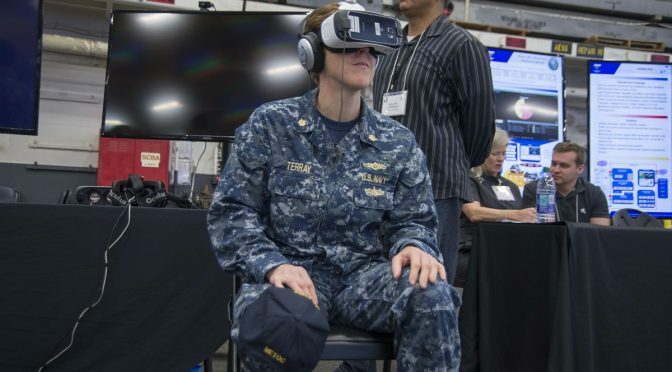 Allison Terray tries a virtual reality headset at the Innovation Jam hosted aboard Wasp-class amphibious assault ship USS Essex (LHD 2). U.S. Navy Photo by Mass Communication Specialist 2nd Class Molly A. Sonnier. All good discussion but not much focus on the challenges that prevent this way of thinking ….. our culture. We must also address these challenges to succeed. To innovate one must sometimes FAIL (First Attempt In Learning). We must have an inclusive climate (“inclusive excellence”) in which people are comfortable offering their inputs AND they are valued (which requires adopting some of the to test). This is a leadership issue — ensuring leaders create the positive climate where innovation can thrive. We must move from risk avoidance toward risk management. We must be open to experimenting and yes, sometimes failing in our tests. The Design for Maintaining Maritime Superiority attempts to describe the culture shift required in moving the Navy from being a predominantly reactive problem solving organization into a proactive, problem seeking organization but the message seems to be lost on many. Actions speak louder than words in how our culture values new ideas. Case in point the fizzled effort of Reduction in Administrative Burdens (RAD) which generated tremendous inputs and the resulting outcomes (or lack of them) speak for themselves. The say-do mismatch gap must be addressed as we tackle the issue of our culture and the challenge leadership must accept. The first step in the 12 step program is admitting we might actually have a problem…..